While air conditioning systems are traditionally measured by ratings like the Seasonal Energy Efficiency Rating (S.E.E.R. ), the problem with this approach is that it does not take into account the actual output of cold and warm air. Since high velocity heating and cooling systems use just a third of the space required in a conventional system, they have less surface area, meaning there is less leakage. Many people who live or work in older buildings know that these structures often don't have a centralized heating or cooling system. Since these buildings are too old for significant renovations that would allow them to support centralized HVAC systems, tenants are forced to rely on baseboard radiators and in-window air conditioning units. These solutions are often loud and difficult to manage. On the other hand, the flexible ducts that are used with a high velocity heating and cooling system can be installed almost anywhere. These ducts can be snaked through existing holes in the walls and floors; no need to worry about noisy, disruptive metal ductwork that leaves a mess everywhere. Drafts are a common problem with traditional air conditioning units, since they have a tendency to push huge amounts of air into a room at once. This leads to uneven temperatures, especially in large areas like living rooms or open offices. With high velocity heating and cooling systems, this problem is avoided. These kinds of systems cool a room by using suction to create a gentle stream of air that circulates through the space, causing it to be heated or cooled evenly. 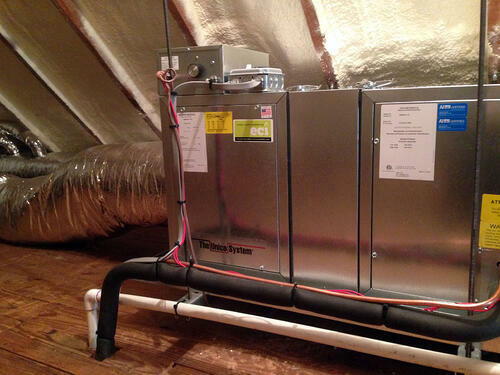 With a conventional HVAC system, ratings are determined using the S.E.E.R. formula, BTU divided by Watts. The problem with this rating is that it is only based on the equipment used for heating and cooling; it doesn't take into account the distribution system that it is connected to. Because conventional systems have more leakage from hot attics and larger ducts that are more susceptible to developing cracks and slits, high velocity heating and cooling systems use much less electricity to cool the same amount of space. This is especially true when ducts are inside the space that is being heated or cooled, because it means you can downsize the condenser. With a high velocity heating and cooling system, you don't need to worry about fitting a huge metal unit or large, bulky ducts in your home or commercial building. 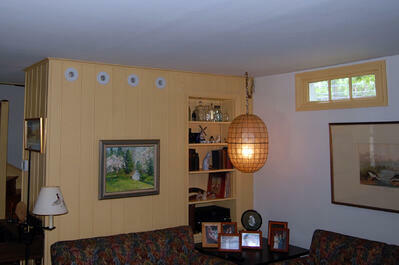 These systems use small outlets that are designed to mesh with the current aesthetic of your home. You don't need to drill any holes or worry about streaks and stains left behind from metal ducts. High velocity heating and cooling systems fit into your building, not the other way around. Those who want to get their building heated and cooled efficiently without a loud, intrusive installation should strongly consider going with a high velocity heating and cooling system to meet all of their climate control needs. ECI Comfort can install an amazing new Unico system in your home, regardless of whether you have new construction or an older home. Give us a call at 215-245-3200 for more information on the quietest HVAC system you've ever known, or click the button below to schedule a free consulatation.